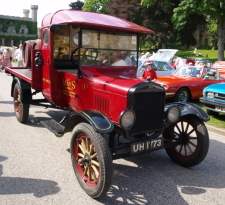 This truck version of Henry Fords motoring classic was built in Manchester (UK), has only seen use in this country and has a top speed of 18 mph. 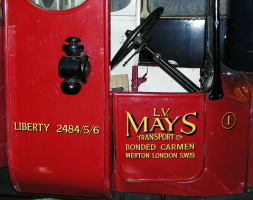 It was restored to its present condition for the A T Mays Transport Companys centenary celebrations and then appeared at many rallies in Southern England before being laid up for many years when that company was bought out. 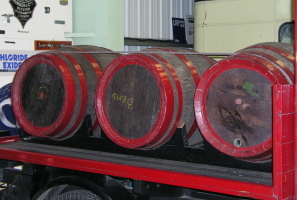 It was purchased by Society member Larry Riches in 2002 and subsequently kindly donated to the LVVS in June 2008; its arrival at the Museum necessitating a hasty driver familiarisation programme. 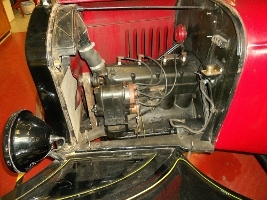 The vehicle has two pedals, one of which is the brake and the other controls the forward and reverse gears, the accelerator being located on the steering column! July 2014 - The TT has been started up, taxed, and tentative steps taken to master its driving controls, which are like nothing else in the Museum. October 2014 - This again moved under its own power at the Car Running Day, although starting it on the handle looks daunting to say the least!